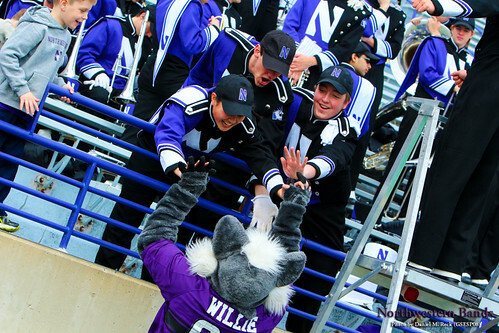 MARCH 30, 2015 — EVANSTON, ILL. — The Northwestern University "Wildcat" Marching Band will perform as Chicago's Big Ten Team is put through its paces during an open practice at Ryan Field on Saturday, April 4. After the Wildcats work out, young fans can learn the game directly from Northwestern student-athletes. "This is a great way to support the 2015 'Cats," says Wildcat Band director Daniel J. Farris. The event begins when Northwestern hits the gridiron at Ryan Field for an open practice at 10 a.m. Admission and parking is free with general admission seating in the stadium. The doors will open at 9 a.m. and the concession stands will be open throughout the event. Following the session, young fans in eighth grade and under are invited to take part in a free skills clinic. Participants will have the opportunity to take part in basic drills and learn the fundamentals of football all while interacting with members of the Northwestern Football team. In addition to the open football practice and the youth clinic, the Wildcats will team up with Lifesource to host the Purple Pride Blood Drive at Ryan Field on April 4 from 9 a.m. until 4 p.m. In addition to being able to watch the open practice from the seventh-floor Stadium Club, all donors will receive a Northwestern Purple Pride t-shirt and the opportunity to take a photo with a great piece of NU history, the 1995 Big Ten Championship trophy. To schedule an appointment in advance, please call 877-LIFESOURCE (877-543-3768) or CLICK HERE. Walk-ins are also welcome. In the fall, the Wildcat Football home season opens Sept. 5 when they face off with Stanford University. Until then, fans may find Wildcat Football on Facebook and on Twitter as @NUFBfamily, they also find Head Coach Fitzgerald on Facebook and Twitter, Be sure to also follow Twitter hashtag #B1GCats for the latest Wildcat athletics action. As usual, the Wildcat Band will tweet from @NUbands, and will be posting on Facebook, Google+, and Tumbr. Videos of band performances appear on YouTube.